Ich habe also drei verschiedene Hintergründe gestaltet. Der ersten ganz klassisch mit Distress Farben. Ich verwendete wild honey und picked raspberry, wobei ich darauf achtete, dass ich zur Mitte hin etwas weniger Farbe auftrage. Danach schnappte ich mir Wasserfarben und mixte mir aus Rot- und Gelb-Tönen ähnliche Farben zusammen. Ich habe ein paar Schichten Wasserfarben aufgetragen, die ich zwischendurch mit dem Heißluftföhn immer schnell trocknete. Zu guter Letzt habe ich noch Alcohol Inks gewählt. Honeycomb und Flamingo sowie die Blending Solution kamen zum Einsatz. Nachdem alles trocken war, stanzte ich die Hintergründe mit der „Framed Tags Waverly“ Stanze von Mama Elephant. Die Tiere stempelte ich mit Memento tuxedo black und kolorierte sie mit Copic Stiften. Ein kleiner Partyhut vom Set „The Cat’s Meow“ durfte nicht fehlen 😉 Für die Sprechblasen wählte ich Lawn Fawn Dye Ink Stempelkissen in den Farben sunflower, ballet slipper und apricot. Die tolle Kiste von „All prettied up“ stanzte ich auch gleich 3x. Mit hickory smoke Distress ink kamen noch ein paar Schattierungen dazu. Nachdem ich alles auf eine schimmernden Kartenbasis befestigt hatte, habe ich die Karten mit Pailletten und chunky Glitter verziert. Fertig waren gleich 3 Karte auf einem Streich 😉 Und? Welche gefällt euch am besten? So I created three backgrounds: On the first one I used distress colors – a classic. I chose wild honey and picked raspberry, carefully fading the colors towards the centre of my cardstock. Then I mixed some red and yellow watercolors to achieve similar colors. I added some layers of watercolors which I’d dried everytime before adding the new layer. Last but not least I used alcohol inks on my last background. This time I went with honeycomb and flamingo. After everything had dried I diecut the backgrounds with the „Framed Tags Waverly“ die from Mama Elephant. The cute critters are stamped with Memento tuxedo black and colored in with Copics. 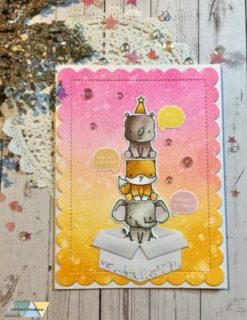 I had to add a little party hat from the set „The Cat’s Meow“ 😉 For the speech bubbles I chose Lawn Fawn dye inks in sunflower, ballet slipper and apricot. I diecut the awesome box from „All prettied up“ three times and added hickory smoke distress ink for some shading. After everything was adhered to a pearl card base I added some sequins and chunky glitter. The three cards were ready! And? Which one do you like best? Thank you for stopping by and have great day!